You can’t sell your project until you’ve convinced someone to read it. How do you convince someone to read it? By pitching it to them! Pitching Thursday (Evening) is back, our popular pre-festival event that prepares you for the weekend of pitching that lies ahead. Pitching is the thing most screenwriters fear the most. Face your fear, and cast it out on Pitching Thursday. When the LSF starts in full on Friday, you will be loaded for bear, ready to face the challenge. ‘The Pitching session with Bob was tremendously helpful and I don’t think that my pitches would have been half as successful without his help and advice’. Join screenwriter, pitching guru, and Great American PitchFest co-founder Bob Schultz as he helps you navigate your journey from screenwriter to PRODUCED screenwriter. In this Pitchfest Primer evening session, critical for every LSF delegate, you will build the toolkit you need to get your script into the hands of the broadcasters, agents, and producers who will launch your career. 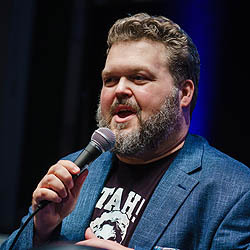 Run by Bob Schultz, Screenwriter, Producer and Co-Founder/President of ScriptFest and the Great American Pitchfest, Pitching Thursday is designed to improve your pitching skills, giving you insight into your style, ideas and delivery. This will ideally prep you for the Great British Pitchfest at the LSF too. Pitching is a necessary part of the business. It is not something to get nervous or overwhelmed about, but a skill to be learned and mastered like any other. Pitching Thursday will give you confidence and clarity as you focus on what is special about your project, and you will learn how to powerfully convey your ideas with clarity, passion and confidence to someone else. Don’t fall into the trap of crippling your project just because you didn’t have a killer pitch. Pitching Thursday (evening) also includes rehearsal pitching in groups so that you get to refine your project for pitching at the LSF. 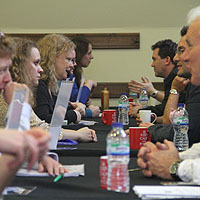 By the end of the evening, your project will be ready to pitch to any producer, agent or executive you meet at the festival. 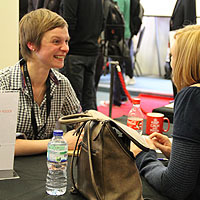 Get the most out of your opportunities at the festival by signing up to Pitching Thursday (evening) today. Possess skills and strategies to make every meeting count. Attack the issues standing between you and pitching success. 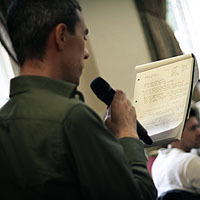 Identify the strengths of your screenplay (and yourself) as they pertain to pitching. Overcome/adapt to conversational landmines that might land your script in the slush pile. Prepare you to pitch professionally, passionately, powerfully and (when you need to), on the hoof! Learn the common pitfalls that kill most great ideas dead. Give you tons of practice – and practice makes perfect! Give you TONS of confidence – if you believe, they will believe too! Turn your fear into FUN! You will leave dying to pitch your projects. Prepare you for the Great British Pitchfest to get the most from your opportunity. ‘Bob’s insights and enthusiasm simply make everything better’. ‘I’ve read loads about the ‘nuts and bolts’ of writing a log-line before but this was the first time I actually felt that I ‘got it’. Brilliant value, he also fixed the log-line for my current script and that was worth the admission price alone’. ‘I Went into the class fearful of having to put on a performance of some kind but Bob walked us through the various stages of preparing a pitch and then practising the delivery in a way that was both natural and comfortable’. ‘I learnt a lot: how the mind of an exec. producer works, how to keep up to date in the industry, how to network, what to expect on a pitching session, and most importantly, fine tuning your logline. I think this course is a must for any aspiring screenwriter, and it’s a lot of good information for an affordable price’. Credits include: Fringe Bootcamp, Below Zero, Hitlersaurus! Talent is great but relationships get you hired. The ability to create powerful new relationships in any given situation is one of the primary factors in the success of your career and that of any screenplay that you write. A one day masterclass.